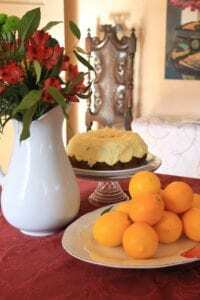 When I arrived at the Bear Creek Inn, the innkeepers were swooning over a beautiful Meyer lemon cake that a neighbor had made and left on the back porch. The neighbor had picked the lemons from the inn’s heritage fruit trees and then left the cake as a thank you. 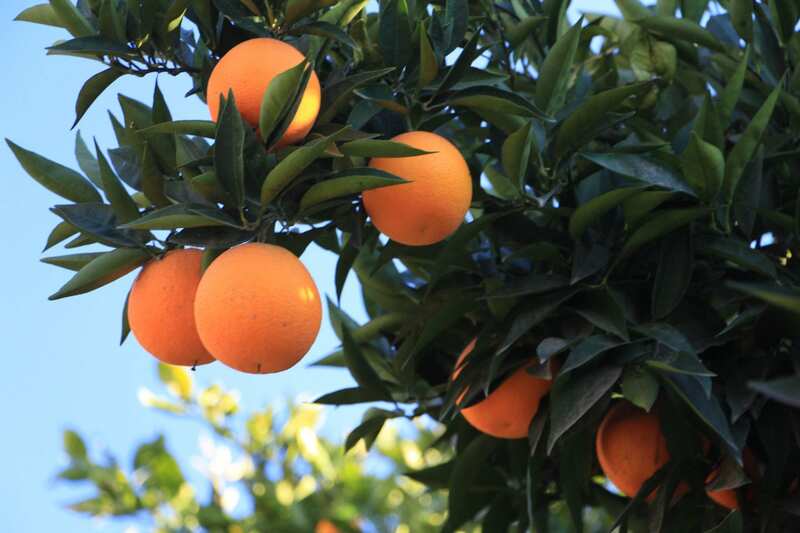 There are 22 varieties of fruit trees lining the perimeter of the grand, white colonial home in Merced. The neighbor has been picking fruit and leaving treats on the back porch for years. Perched on an antique glass cake stand on the dining room table next to a vase of flowers and a plate of Meyer lemons, the cake was a charming welcome to this rising Central Valley college town and a beautiful, historic inn. The inn’s property was originally the site of a three-story Victorian mansion with a ballroom that was built in 1886 by Henry Huffman. Huffman was a former gold-seeker who became one of the largest wheat growers in the San Joaquin Valley. In 1859, he began serving as a town site agent for the railroad, selecting town sites and securing the land and rights-of-way for the train. He is credited with choosing the site for Merced and is considered one of the founders of the town. In 1933, Huffman’s original Victorian home caught fire and burned to the ground. In 1936, a Merced native and prominent attorney, C. Ray Robinson, rebuilt a grand, white colonial on the property that stands to this day. Upon Robinson’s death in 1974, the home was donated to the Dominican Sisters. By 1987, the home had fallen into disrepair and was slated to be demolished and turned into condominiums. 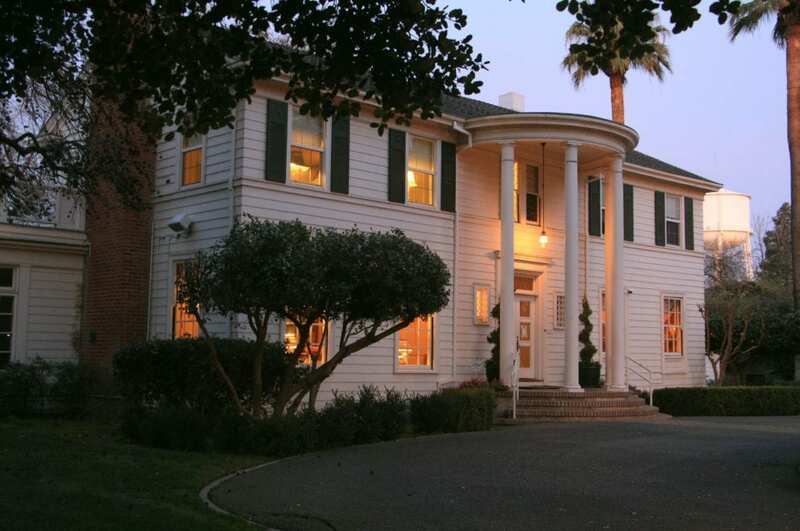 Instead, an esteemed professor Jack Hooper and his wife Mona, both descendants of early Merced County farmers, matched the offer of the condominium developers and began the work of restoring the home to fulfill Mona’s long-held dream of turning Merced’s most prestigious home into a bed and breakfast inn. Mona died from cancer in 2000, a year before the inn opened to its first guest, but her husband Jack saw her dream through until his own passing in 2013. In 2014, a delightful pair of sisters–Jana and Melinda Stewart–who are part of an old Merced family, purchased the inn with a dedication to maintaining the quality, charm, and tradition that the Hooper family had established years before. 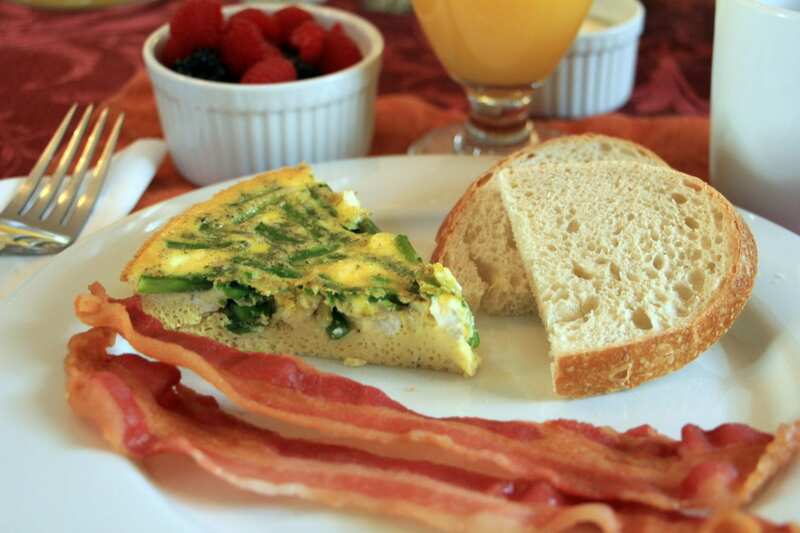 The inn sits on a nearly two acres near downtown Merced, surrounded by graceful old trees. A sprawling lawn beneath the trees and a wide brick patio lit by string lights at night make a lovely setting for outdoor weddings and events. The entrance to the inn features a semi-circular porch supported by towering white columns. 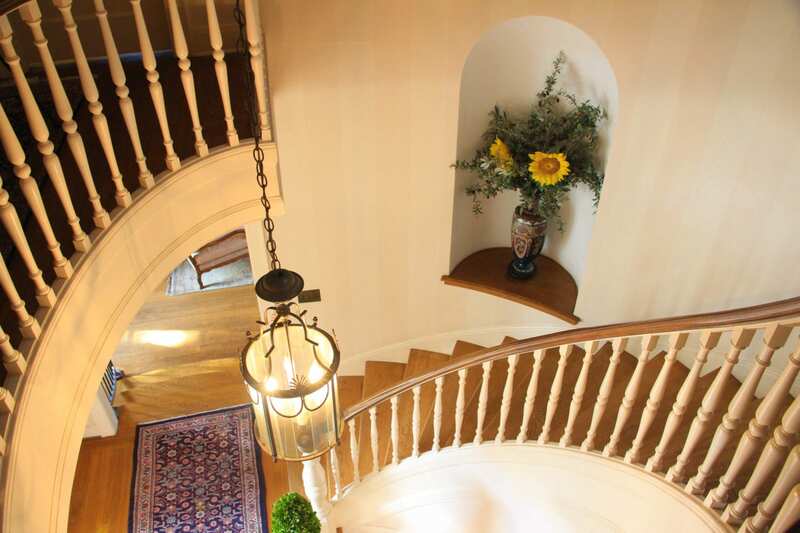 Just inside, a sweeping spiral staircase winds its way up to the second floor. 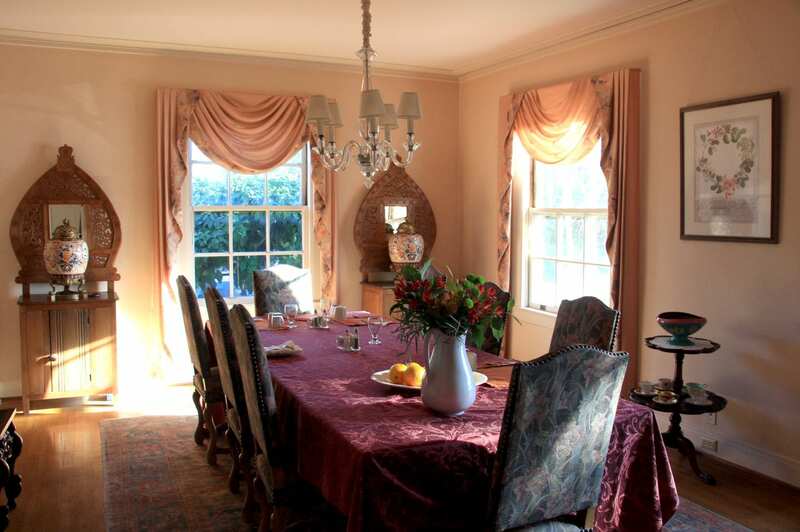 To the right stands a formal dining room where breakfast is served each morning. To the left stands the parlor with a wood-burning fireplace. Off the back side, a delightful sun porch with French doors opens to the backyard. 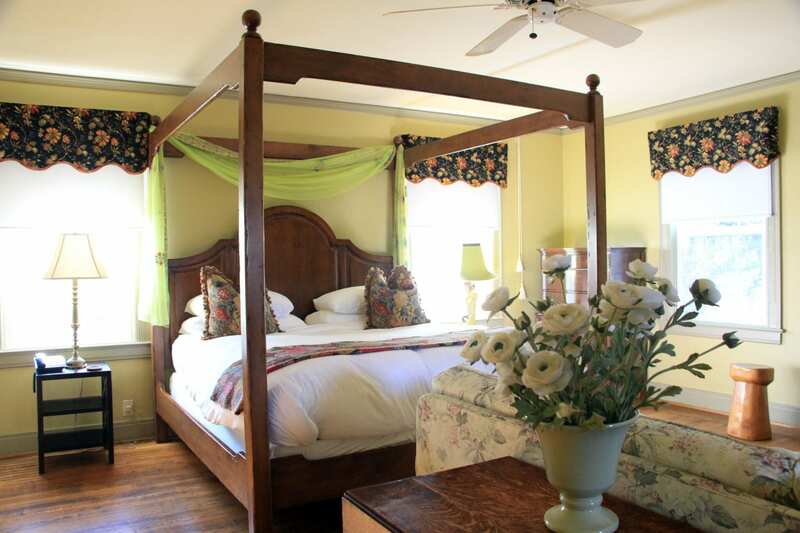 The inn features five guest rooms: three on the second floor of the main house, and two cottages in the back. The inn is tastefully decorated with an eclectic mix of antiques and artwork collected from a lifetime of travels by the Stewart sisters. The room I stayed in, the RaPaula, is an elegant, spacious, light-filled suite featuring a brick fireplace, two dressing rooms, more closet space than I have in my own house, and a large, private deck overlooking the backyard gardens. The focal point of the room is the handsome, king-size, four-poster wooden bed draped with hand-embroidered green sheers and covered with a divine featherbed, lofty down duvet, and soft-as-silk white linens. 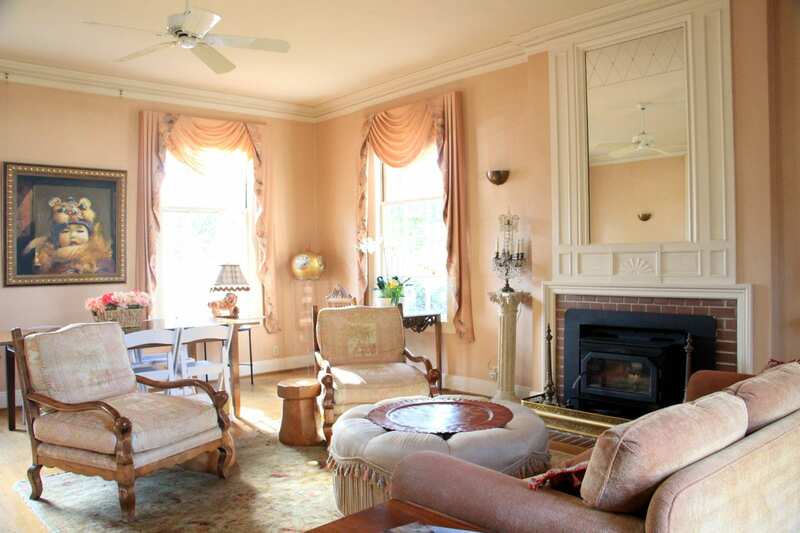 The ecru-colored walls, hardwood floors, original wood moldings, panel doors, and large bath with original hex tiled floors are all in keeping with the period of the home and matched in their charm by the antique furnishings. After I settled into my room, I headed to downtown Merced, which has enjoyed a revival since the opening of the University of California, Merced in 2004. Downtown is home to the Saturday morning farmers market and numerous cafes and restaurants. J&R Tacos is co-owned by a UC Merced alumna. Little Oven Pizza and Asip Coffee Roasters are recent additions to the downtown scene, thanks to demand from the university community. Depending on the day of the week, you might find family-friendly interactive exhibits or performances at the Merced Multicultural Arts Center or live shows at Playhouse Merced and at the Merced Theatre. For dinner, I met one of the innkeepers at Bella Luna Bistro, a warm, convivial Italian café in downtown helmed by Chef Vinnie DeAngelo. Over pizza and handmade pasta, she shared delightful stories of the inn’s owners, both past and present, and how the town has evolved since UC Merced opened its doors. UC Merced’s new Downtown Campus Center, which opened in January and brought hundreds of staffers into downtown, is serving as a catalyst for several major renovation projects involving historic Merced buildings. Construction is also underway for a master-planned campus expansion. The first phase, which was completed last month, added a 600-seat dining facility, 20 classrooms and 729 new beds of undergraduate student housing. When fully completed in 2020, the expansion will double the campus’ physical capacity in terms of classrooms, laboratories, housing, and facilities, and enable enrollment of up to 10,000 students. Bear Creek Inn hosts a number of the university’s visiting professors and guests. At breakfast, I met a young professor who was interviewing for a position at the university. He was weighing offers from other universities around the country, but was impressed by the town and the kindness of the people he had met. He was also intrigued by Merced’s proximity to Yosemite National Park—which is less than two hours away. Having lived on the East Coast, he had never seen Half Dome and was excited to visit. Other natural attractions closer to Merced include the Merced National Wildlife Refuge, which supports a rotating array of migratory birds throughout the year and Yosemite Lake, which is a peaceful place near the university for picnics, boating, fishing, and stand-up paddle boarding. Merced also boasts a charming zoo and a museum housed inside Merced’s historic 1875 county courthouse.